This was scrumptious. A chocolate pudding cake with roasted pears and ice cream - yummy! We all shared it. Mara looks just beautiful in this picture! I can here her laughter. When it comes to her own person and things that benefit her personally, my sister is one of the most unassuming and unselfish people I know. When it comes to matters of principle, she has a backbone of utter steel. I would rather face the machinations of Jesuits than run up against my sister. Who is, by the way, a genius, in case you haven't read her thesis, which I just finished. Highly recommended. Actually, I can hear her laughter, rather than here it. *sigh* Every day I pray to the Lord for talent, and every day he points out that while Ben Affleck still walks the earth there are men in more desparate need than me. This page contains a single entry by Mara published on December 23, 2003 7:55 AM. 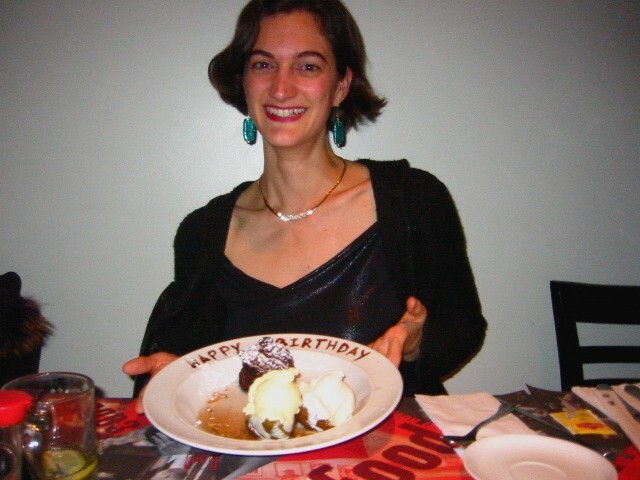 My Birthday Dinner at Giraffe was the previous entry in this blog. 2004 is the next entry in this blog.